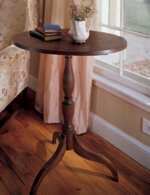 This classic oval table will make a beautiful addition to your home and the tilt-top makes it convenient for storing if necessary. For those of you who are interested in building this project, but do not want to turn the pedestal, see the Buying Guide, provided with the plan, for a preturned one. For those up to the challenge, but needing a little help, see the turning instructions included. Wood and/or Supplies needed: We used walnut and edge glued walnut, but you can use a wood of your choice.